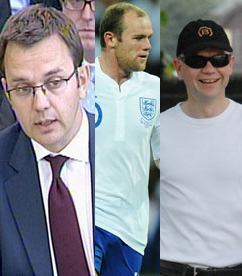 In a post on today’s UK Human Rights Blog Adam Wagner looks at the recent press coverage of Wayne Rooney, William Hague and the News of the World phone hacking saga from the human rights perspective. There are, of course, common themes running through all three stories – in particular those of press responsibility and public interest. We have discussed these issues in previous posts in relation to William Hague and, most recently, Wayne Rooney. The UK Human Rights Blog is right to consider the three stories together and to say that they all involve the question of the “balance” between two “qualified Convention rights” – the right to freedom of expression in Article 10 and the right to respect for private life in Article 8.
it is impossible to restrict freedom of the press in instances we find morally reprehensible without having a chilling effect on what we may consider to be more worthy journalism. So, the lesson to be learned from this swirling innuendo is not that the right to privacy should be strengthened, but rather than the qualified protections under European Convention should be bolstered and brought into line with those under the American Constitution. We do not agree. The fact that it is difficult to balance the rights to privacy and expression does not mean that we should give up and simply treat expression as a “trump card” which always wins. The Court of Human Rights has, over the past 5 years, developed a careful jurisprudence on how this balance should be carried out. We have discussed these cases on this blog on a number of occasions – for example, the post on “Six Court of Human Rights decisions on defamation and privacy prosecutions”. That Court will return to the issue in the Von Hannover (No.2) case on 13 October 2010 (see our case preview here). The US approach is inconsistent with the approach of the Court of Human Rights and is, we believe, wrong in principle. Unlike the mainstream US media, the English tabloids cannot be relied on to confine their privacy intrusions to matters of public interest – quite the contrary. The blurring of the boundaries of journalism is a challenge but does not alter the fundamentals. Whoever is doing the publishing, a proper balance must be struck between private life and freedom of expression. On a practical note, there is no evidence at all that the developing privacy jurisprudence in England has led to the suppression of proper public interest journalism. Politicians and business leaders are, in general, well advised not to seek such injunctions – and on the rare occasions that they do, their applications do not succeed. No convincing case has been advanced to support the contention – understandably popular with those sections of the media which like to publish “kiss and tell” stories – that public interest journalism has been “chilled” by the law of privacy. In short, the recent stories involving a politician, a footballer and a newspaper do not reveal the need for “more protection” for the press. What is needed is a greater sense of “journalistic” responsibility and a keener appreciation of the limits of “public interest”. This is something which should not be a matter for the court – its weapons are blunt and extremely expensive. Journalistic responsibility should, in the end, be a matter for journalists and editors themselves or for those responsible for regulation.